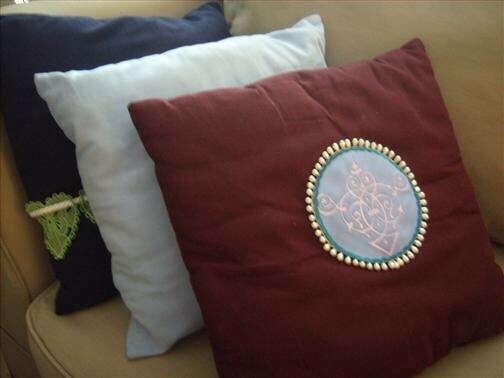 If you open any decorating magazine, regardless of age, you are going to find some awesome ideas for pillows. They are embroidered, quilted, bedazzled, fringed and all manner of ideas known to woman (or man. . . ). One of the issues, at least for me, is that they are pretty much permanent in their design. They are made to ‘pop' in a certain design scheme as replaceable, inexpensive accents. They are tossed, punched and baby ‘cookies' have been deposited upon them. Well, I decided that I wanted ‘dynamic pillows' that could change when I changed my décor. I wanted the pillows to be alive with ideas and interests that represented me for the current time and place. Therefore, I elected to use my beautiful embroidery items to lead the way to something that was really mine. 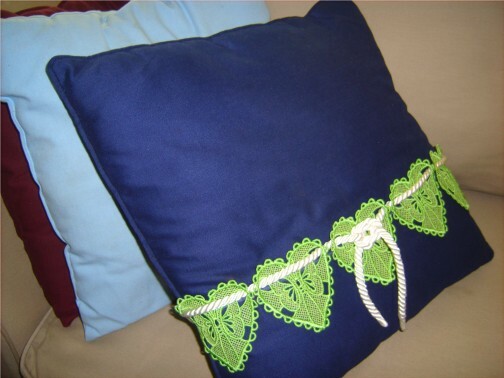 The first idea I had was with free standing lace (fsl). If you have been reading the Forum the past few weeks, there has been a lot of discussion on fsl resizing. You can see the discussion here. My project did not need to be resized, so I created five hearts from the collection by Starbird. This collection has several different designs that would work in a similar project, and each design is available as a single. As I have noted before, I am a big fan of Badgemaster Stabilizer. It is a little pricey, however, there is a significant amount on this bolt AND, it really is professional quality. I have never had it fail and frankly, once you try it, you won't use anything else for fsl. I have used it for many projects, some not even fsl, for two years and still have a lot of it left. 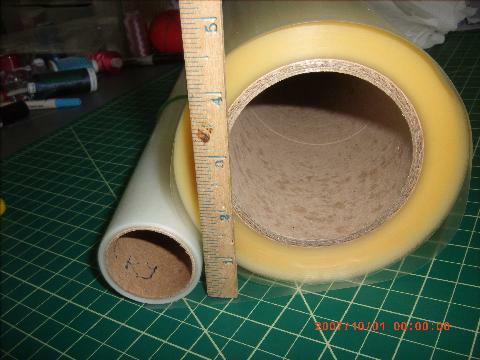 Here it is, standing nearly 5" with a standard roll of stabilizer. Professional size ad professional quality. I also use the brayer for making my fsl very flat. 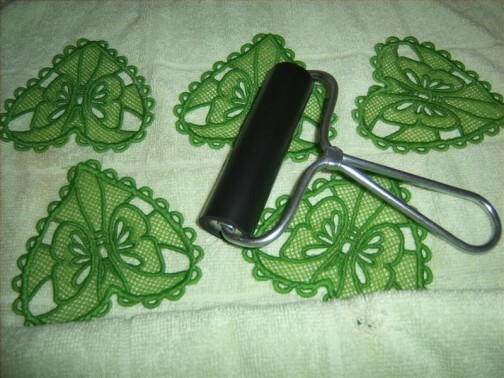 I use the brayer on the wet fsl and it presses the embroidery without losing the delicate texture of the design. 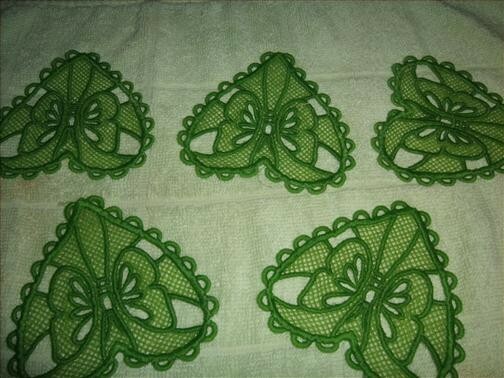 If you have ever ironed a design you know that the heat will cause your embroidery to become much less dimensional. Part of the beauty of embroidery is the stitch variety of heights as well as widths and depths. I created my project by sewing the fsl together and then to the pillow. I only put a few stitches to tack it down. These pillows, like their decorator cousins will be for looking, not sleeping. 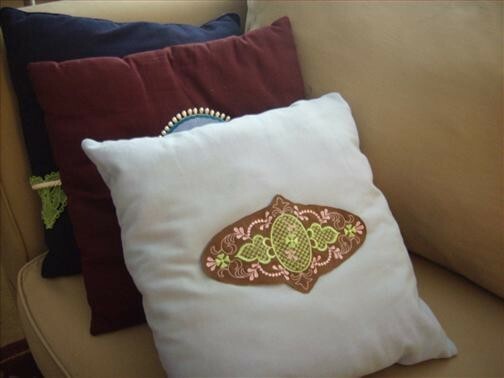 And since I did the embroidery apart from the pillow, I can change it as often as I like. Here is another of my projects. I used a ‘discovery sew,' which you may know as a ‘sew out.' Either way, the test of the design was just fine and I always wanted a use it somewhere. So, I created an outline (darker blue) with the ‘frame' selection on my BabyLock and trimmed it with a strand of decorative beads. Again, I securely tacked it on to my pillow so that I could use that pillow again for a different look. Last but not least, I have a light blue pillow that has had a life of adventure and has suffered some spots and stains. Again, back to my ‘discovery sew' items and found one of the designs from Morango Digitizers and available here at AnnTheGran. This is part of a great collection but available as a single as well. I have used this collection so many times! It is wonderful for linens and I have always imagined doing a lace skirt for a bride or bridesmaid with one of these great designs. I can see that I will be redoing these pillows for a long time and enjoying every minute of it. 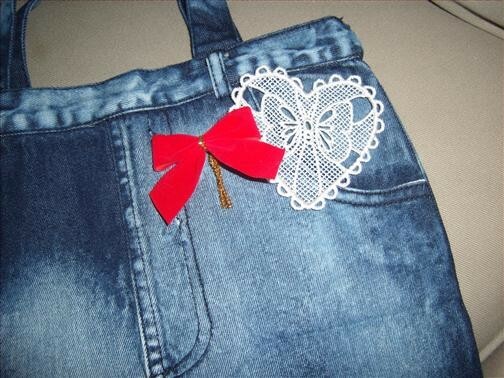 Then, because I get a little carried away, I did work with a denim tote that I own. 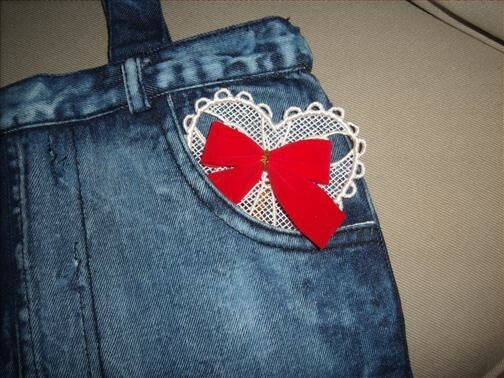 The same process could be used on jeans or other items for a little girl. I use the Butterfly from the same Starbird designs and a small bow that did not get put away with the Christmas decorations. The bow has its own 'twist tie' so I can remove it before washing, I think it would not survive the wash.
Gee, so many ideas, so little time!! Thanks for reading about my ideas, you will have many more. Please Comment below and tell us all what you did. Thank you, Jo! During the creation of this blog, I was thinking about other uses for attaching embroidery to a project. Some items, for instance, an expensive or unreplaceable garment, may be good candidates for me to create the design on another fabric and carefully tacking it on to my garment. These come to mind - bridal gowns, leather goods and heirlooms. My projects represent my views, and I am sure that there are many ways to work with other methods. Is Badgemaster Stabilizer what I would use to create patches for my club so that the members can stitch them on whatever garment they would like? I have used Badgemaster for patches (aka badges) before. It really is heavy duty. As I noted, you really will find many uses for this stabilizer. I use the scraps as 'floating' stabilizer. That is where I am using a hooped, standard stabilizer, but place a piece of Badgemaster under the hoop not attached to the hoop. It gives the project a little more stablity. I would love to see a photo of that! If you go to the Forum, in the General Discussion, Select "Write a New Post." While in that writing area, select the icon that looks like a Film Strip. Select Browse, Upload and Browse again to look at your computer photo. Follow the prompts from there. We will be able to see that beautiful face and your terrific project.